The Renephra patented Fluid Removal Device uses micro-needle technology combined with negative pressure therapy to access and remove excess interstitial fluid from the skin. 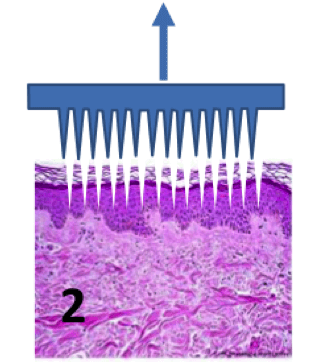 A microneedle array is applied on the oedematous skin surface. A high impact applicator will be used to apply the array into the skin. 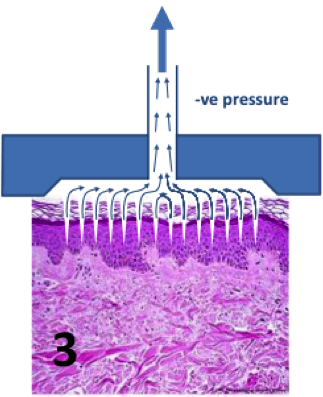 The microneedle array is removed leaving channels in the skin for the fluid to emerge. Negative pressure is applied through the head which is connected to a negative pressure pump. Removed fluid is collected in a canister attached to the pump. The goal is to provide a safe, gentle, and simple medical device for patients to use as home. The team envisage that the device will be applied daily by a district or heart failure nurse who visits these patients during exacerbations of their condition. It is planned that the patient will be able to remove the device at the end of therapy and change the canister if it gets full during treatment. However, due to the simplicity of application and removal, it is envisaged that the therapy could be entirely patient administered for some patients. 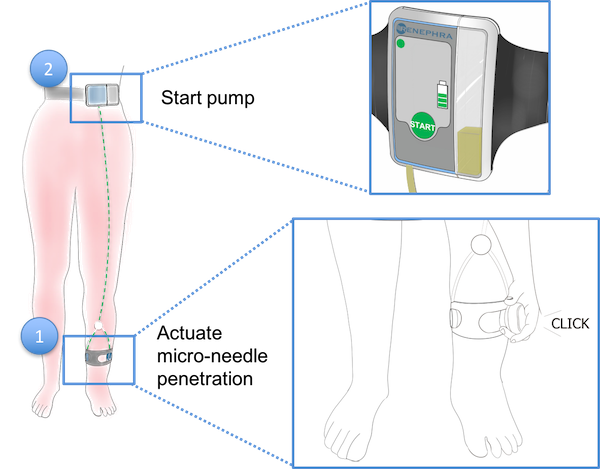 It is expected that the device will be applied daily during a period of 1-3 weeks until excess fluid is removed and then patients will start responding to oral water pills (diuretics). It should be applied for up to 12 hours per period (e.g. overnight) to allow gentle fluid removal. 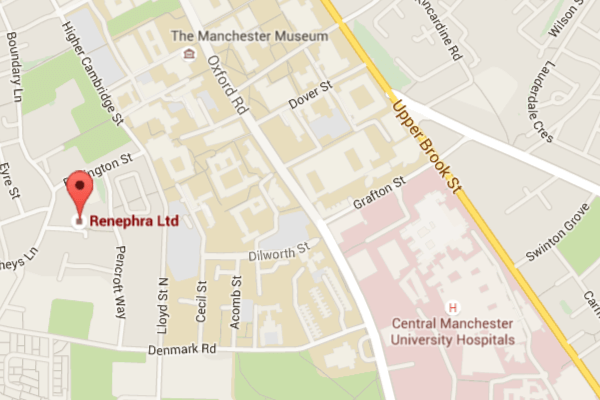 The award winning research at the Central Manchester NHS Trust (CMFT)/University of Manchester has established that the main reservoir (80%) for the excess fluid in fluid overload/oedema is the subcutaneous interstitial fluid. Studies at CMFT demonstrated that this fluid is immediately accessible once the stratum corneum is breached in 80% of 104 patients. Volumes of up to 60ml of fluid were removed using a single 7cm2 microneedle array and applying a -200mmHg negative pressure for up to 4 hours in some patients with extensive oedema . These studies showed that such fluid removal was proportional to time. Investigators then postulated that fluid removal will be proportional to surface area of application and hence the extension of these two variables will enable the removal of clinically relevant volumes. Clinicians estimate that a significant volume for such a device will be between 250 and 1000 ml per day. Recent proof of concept studies confirmed that removal of clinically significant volumes of fluid (>200mL) transdermally is feasible in some patients. Success rate in "all cause" oedema was 28% (4/14) and 50% (4/8) in heart failure and nephrotic patients. Transdermal Fluid Removal (TFR) was well tolerated by patients and subjective reduction in swelling was reported by 2 patients where >200mL of fluid was removed. Patient tolerability data is excellent with the interventions being completely painless, no bleeding seen and patients finding the device comfortable and unobtrusive. Skin studies show a return of skin barrier function within hours of device removal, with no discernible skin marks within 48 hours. 98% of subjects experience no complications from this treatment. Localized asymptomatic blisters occurred in about 2% of cases over the microneedle application area, all resolving within a couple of days. 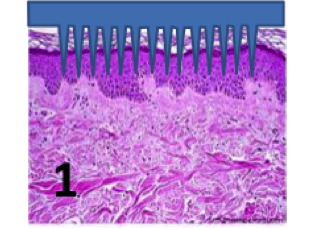 Initial analysis suggests incomplete microneedle penetration to be a key factor to blister formation, currently addressed by an improved application technique. The albumin (protein) loss has been negligible (3g/L); less than in dialysis treatment. Device development study will be undertaken in 2018 (commencing in April) to demonstrate improved success rate in heart failure and nephrotic patients through iterating key device parameters. © 2018 Renephra Ltd. All rights reserved.